Henry V, the last of the five plays forming the acclaimed debut season of the Michael Grandage Company, recently opened at London’s Noël Coward Theatre - with entertainment lighting specialist White Light supplying the lighting once again, as it has done since the season began last December. 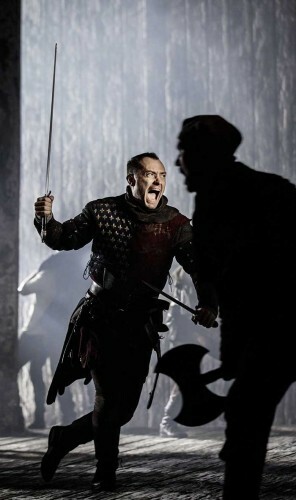 With a cast led by Jude Law as the English King, Henry V follows Privates on Parade (which featured Simon Russell Beale), the world premiere of John Logan’s new play Peter and Alice (featuring Judi Dench and Ben Whishaw), The Cripple of Inishmaan (featuring Daniel Radcliffe) and A Midsummer Night’s Dream (featuring David Walliams and Sheridan Smith). The productions have all been directed by Michael Grandage, formerly artistic director of the Donmar Warehouse, and designed by Christopher Oram. One of the main aims throughout the season has been to make the productions accessible to all through pricing and so 100,000 tickets across the season have been made available for just £10 each. White Light has worked closely with two regular collaborators across the season: Paule Constable, who lit the first four shows, and Neil Austin, lighting designer for Henry V. At the start of the season, White Light supplied the core infrastructure that would remain for the entire fifteen months, including an ETC Eos control system, network data distribution and a FOH rig of ETC Source Fours and Revolutions. The remainder of the rig has then been supplied as required for each production, to suit the specific demands of each show. For Henry V, White Light supplied an all-tungsten rig including ten DHA Digital Light Curtains, ETC Source Fours and Source Four Pars, L&E Battens, 5kW Fresnels, colour scrollers from Wybron and Rainbow (all configured to allow console control of fan speed to minimise the noise of the rig), plus an Atmosphere haze machine and Viper smoke machine.